We have updated our workshop page with 3 new workshops for this Autumn! 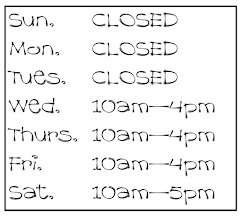 All are on a Sunday and are from 10am - 4pm and Janice Anderson will be your tutor at the shop. Spaces are limited to 6 per workshop so you are guaranteed individual tuition. We'll provide tea and coffee and some homebaking. You bring a pack lunch! Call the shop (01333 312 042) or pop in to secure your place. Please book early to avoid disappointment! This workshop is aimed at knitters who would like to give their knitting a professional finish. If you hate sewing up, or are always disappointed with the look or fit of your finished projects, this workshop is for you. Techniques to be covered: Garment fit and adjusting your tension, blocking, invisible seaming using mattress stitch, shaping techniques, picking up stitches for bands and collars, buttonholes, three needle bind off and many more tips and techniques. Class requirements: You will need approx 100gms of DK weight yarn in any colour (best to avoid dark colours such as black or navy), 2 sets of 4mm knitting needles, scissors, sewing up needle (for knitting) and a tape measure. This workshop requires the participants to complete a very small amount of homework in advance. You can collect your homework sheet when you book! 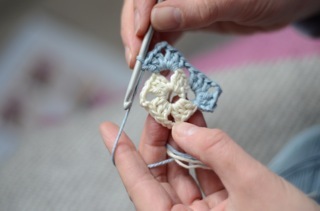 You can see what happened at our last Learn to Crochet workshop here! Aimed at those who want to knit socks. If you can follow a pattern, knit, purl, increase and decrease then you can do this class! 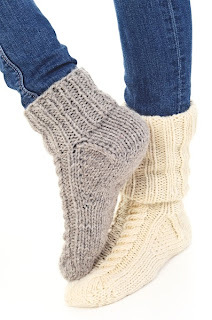 You will learn how to knit a chunky cable sock using 2 circular needles from the toe up! You can knit a sock in a day! Techniques to be covered: using 2 circular needles, best toe up cast on and cast off methods, cables without a cable needle, short row heels. All these skills are easily transferable to other types of socks.